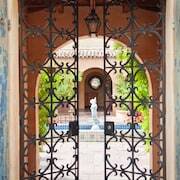 Guests enter Royal Palms Resort and Spa in the Unbound Collection by Hyatt through mahogany and iron double doors. This Mediterranean-style property was built in 1929. 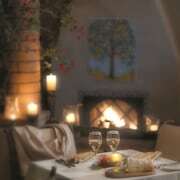 It is ideal for groups or couples; the staff includes a Director of Romance. 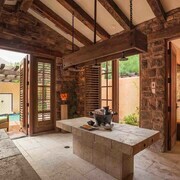 Intimate and tranquil, the Alvadora Spa indulges the senses with natural beauty and the finest spa amenities. Eight treatment rooms many spill into serene courtyards. 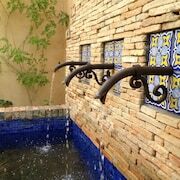 Experience therapies incorporating the calming Vichy showers or cascading outdoor 8-foot waterfall showers. Alvadora offers a collection of signature treatments centered around the nurturing essences of the Mediterranean, soothing the spirit, renewing the body and enriching the mind. Guests can dine at this Phoenix hotel's elegant main restaurant, have a snack at the poolside café, or relax in the lounge by the courtyard. Room service is available 24 hours a day. In addition to a 24-hour health club with private classes, the property includes an outdoor pool, a sauna, and a steam room. 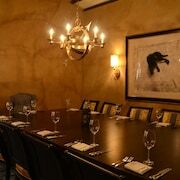 The resort includes 20,000 square feet of indoor and outdoor meeting spaces with antique furniture and stone fireplaces. The hotel can also provide audiovisual equipment, event catering, and exhibit space. The business center is open 24 hours a day. Complimentary wired and wireless Internet access is available. Royal Palms Resort and Spa in the Unbound Collection by Hyatt is a residential hotel within 3 miles of Biltmore, downtown Scottsdale, and the Scottsdale and Biltmore fashion parks. Taliesin West, Frank Lloyd Wright's Arizona home, is within 15 miles. Camelback Mountain is nearby. This Mediterranean-style hotel is lushly landscaped with palms, cacti, citrus trees, and flowering shrubs. The on-site Alvadora Spa offers body and beauty treatments. Guestrooms contain desks and leather chairs with ottomans. Decorated with deep, vibrant colors and bold patterns, guestrooms at this Phoenix hotel also include beds with upholstered headboards. Room amenities include free WiFi and iPod docks. Royal Palms Resort and Spa in the Unbound Collection by Hyatt offers 119 air-conditioned accommodations with iPod docking stations and minibars. Pillowtop beds feature Egyptian cotton sheets, down comforters, and premium bedding. Televisions come with premium satellite channels, first-run movies, and pay movies. Bathrooms include bathrobes, designer toiletries, complimentary toiletries, and hair dryers. This Phoenix resort provides complimentary wireless Internet access. Business-friendly amenities include desks and safes, as well as phones; free local calls are provided (restrictions may apply). Additionally, rooms include coffee/tea makers and irons/ironing boards. 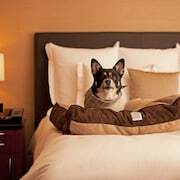 Refrigerators, in-room massages, and hypo-allergenic bedding can be requested. Housekeeping is provided daily. T. Cook's - Elegant restaurant with Spanish colonial-style architecture, earth tones, vaulted ceilings, and panoramic views. 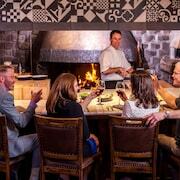 Mediterranean cuisine with seasonal and fire-roasted dishes. 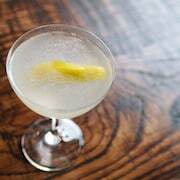 Serving breakfast, lunch, dinner, and Sunday brunch. 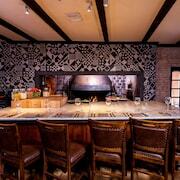 The Mix-Up Bar - Decorated with cherry wood and hand-painted Italian frescoes. Located off the resort's courtyard. Cabana Café - Poolside restaurant serving salads, sandwiches, and drinks. Room service can be ordered for breakfast, lunch, and dinner.